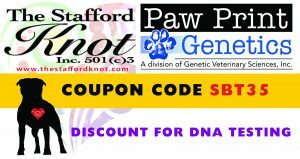 The Stafford Knot, Inc. is a collaborative effort from like minded Stafford enthusiasts from around the world whose common goal is to preserve the Staffordshire Bull Terrier as written in the breed standard to the best of our abilities, and to promote health testing in the breed. The Stafford Knot, Inc. also provides education materials and mentoring. Our goal is to raise the much needed funding for Stafford rescues by offering auctions, collectible and book sales, fun days, advertisements in our publications, calendars, Smile.Amazon, The Store at TSK, and cafe press shops via this website and our FB page. The popularity of this breed is rising and as such so are the needs of rescue. The Stafford Knot, Inc. is an independent not for profit registered 501c3 organization and is not affiliated with any specific breed club. We reserve the right to approve or disapprove any material submitted. All material on this site is copyright protected & cannot be used unless indicated without the written consent of The Stafford Knot, Inc.